The train from Central Station dropped us at Maghull at 10.30, and we resumed our northward progress at the footbridge we had reached a few weeks ago. It was warm and overcast, but the sun broke out later in the day. Last time we had been bemused by the idea of a WWII blockhouse guarding the Maghull railway bridge, but now I’ve read up on it, it seems that the Army viewed the Lancashire coast and plains as a possible site for an amphibious and airborne landing, so the canal was fortified as a “stop line”. See Canal at War. Just before Maghull Hall Swing Bridge there is a another of the WWII defences – a brick pill box under a weeping willow. 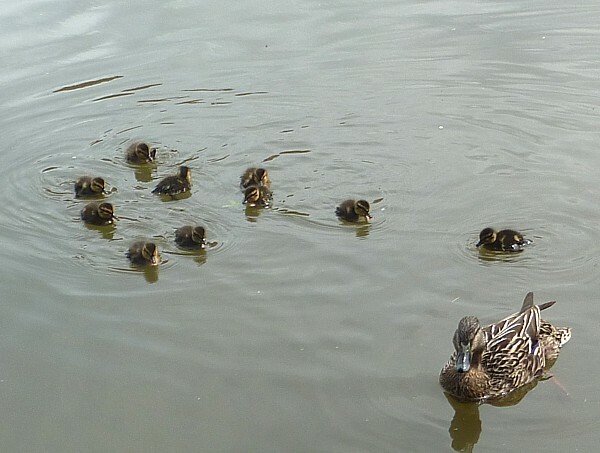 The canal was full of Mallards, Coots and Moorhens. The Mallard drakes were already starting their summer moult while the mother ducks were busy with large broods of ducklings of various ages. Their survival rate seems to be excellent, so are all the Pikes here fished out? 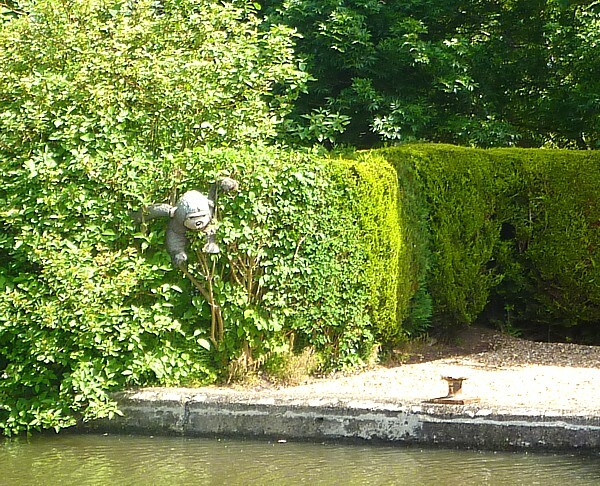 Much of the pleasure of the day was admiring the gardens on the other side of the canal and the surprising things some people put in them. As well as the expected garden furniture and bowers, one had an enclosure for two enormous pet rabbits, while someone else had a gorilla peeping out of their hedge! We lunched at the Methodist Swing Bridge over Green Lane, which was blown up by the IRA in 1939, causing barge traffic to be blocked for a while. 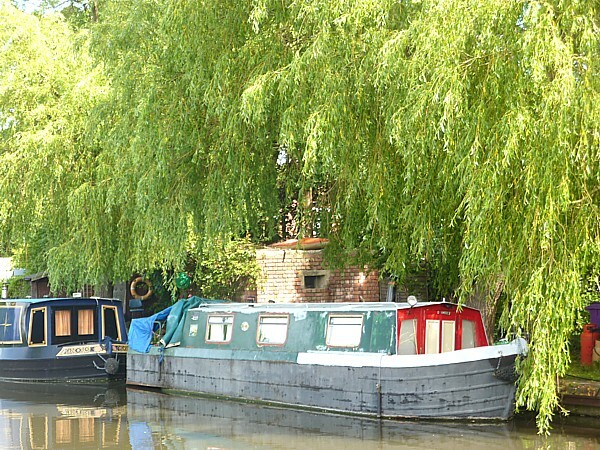 See Towpath Treks for some pictures. 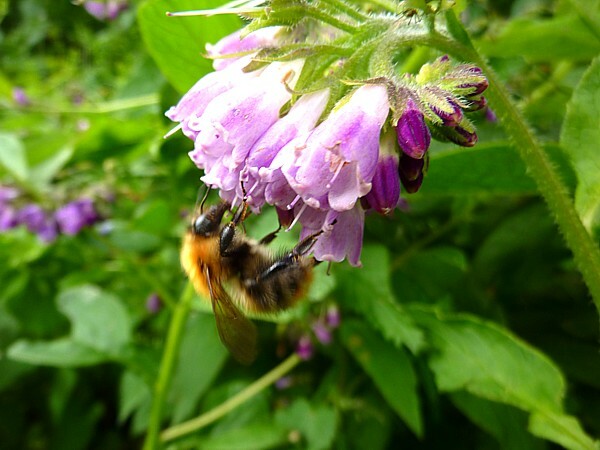 After Lollies Bridge, near the Scotch Piper pub, the bank of the towpath is full of comfrey, which is a magnet for bees of all sorts. This one is probably the Common Carder Bee. 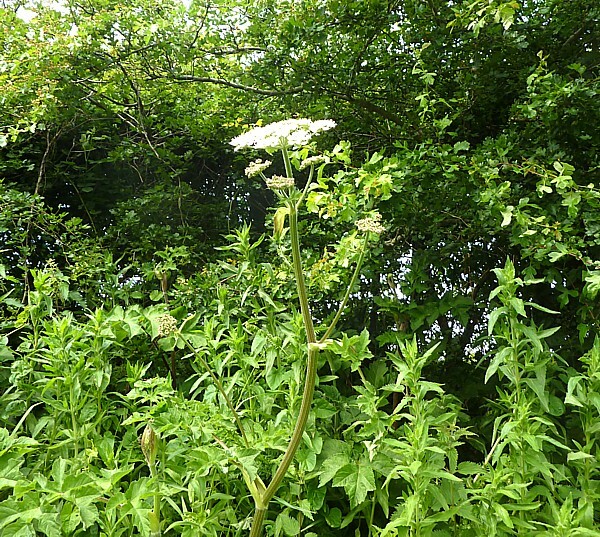 There was also a tall Hogweed in early bloom. Sheena’s book says it was given that name because the blossom smells like pigs. We bent it down for a sniff, and yes, it stinks of the pigsty. 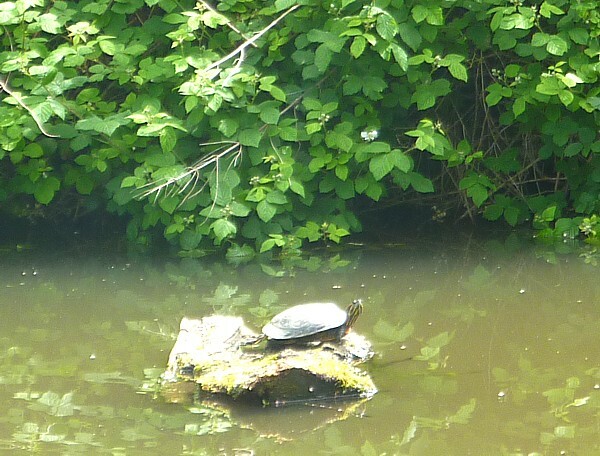 As the sun came out we spotted a lonely Red-eared Terrapin sunbathing on a floating log. They aren’t native, but thousands of them were introduced into Britain as pets in the early 1990s, during the “Ninja Turtles” craze. Although it is illegal to release them into the wild, many parents surreptitiously disposed of their children’s terrapins once their entertainment value had worn off. They weren’t supposed to survive hard winters, but this one has definitely survived the one we’ve just had. They are thought to pose little threat as an alien species because Britain isn’t supposed to be warm enough for their eggs to hatch – they need 25°C (about 75-80 °F) for 60 days. We should be so lucky! See this discussion. However, in January 2010 The Independent ran an article suggesting some baby terrapins are hatching in London. 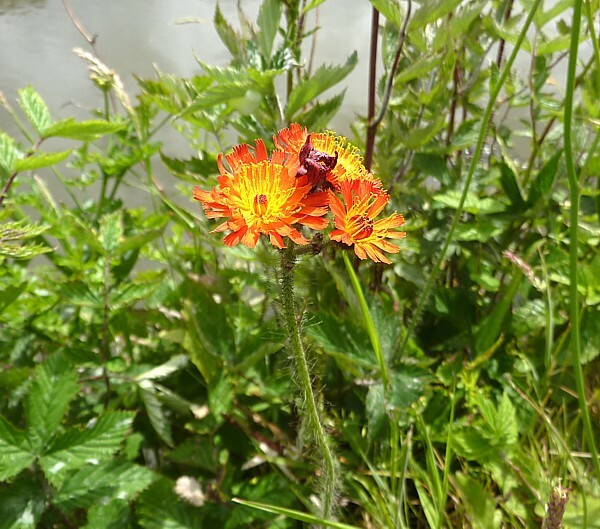 Other flowers seen today included Fox-and-Cubs and Foxgloves, both on the edge of the canal. 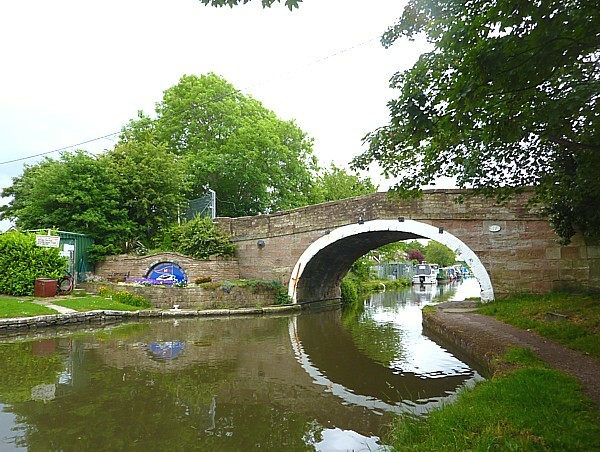 We turned off the canal at Jackson’s Bridge, after the 15-mile marker, and headed down Hall Lane to the main road. Ten days ago I spotted two House Martin nests at the building called Barn Hey. One was occupied, with parents bringing food. The house owner thinks those chicks had fledged, and a single bird was bringing food to the other nest, perhaps the male feeding a female sitting on a second clutch. 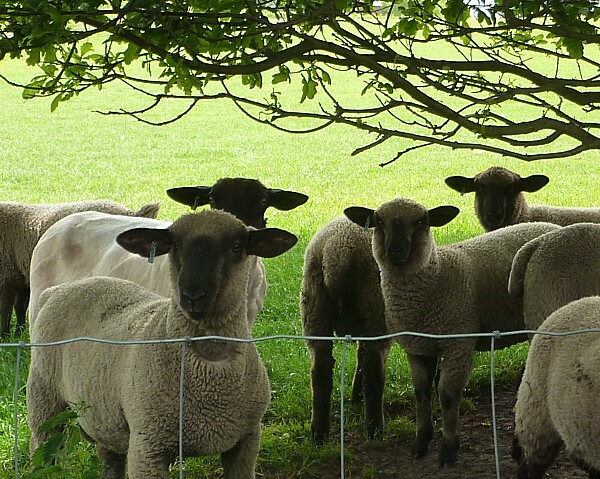 Further along, the young sheep were clustered in the shade of a tree, looking curiously at passers-by.